Dumpy was a handsome crossbreed. Her father was a registered Doberman Pinscher. Her dam was a registered Irish setter. She belonged to Mrs. Harvey C. Stiles, of Granary Cottage, San Jose Mission, San Antonio, Texas. Always, from puppyhood, she had been clever and original, as befitted the offspring of two such breeds. But not until July 9, 1938, did she develop the amazing trait which was described in so many newspapers at the time. On that day, Dumpy came home from her usual daily walk; carrying a crumpled strip of paper daintily between her jaws. She laid the paper at Mrs. Stiles' feet, then stepped back waiting to be thanked for her gift. Instead of thanks, the dog was greeted with a stare of blank amazement. For the strip of paper was a $1 bill. The bill was badly mussed up and it was crusted with fresh earth. Yet, undeniably, it was a dollar bill, and apparently a good one. Mrs. Stiles' family and one or two neighbors came in to see the treasure trove Dumpy had brought home. Many were their exclamations of wonder. Next day, she came back from her walk with another dollar bill, similarly rumpled and dirt-sprinkled. And again she was met by the same chorus of astonishment. Day after day she returned from her stroll, always carrying one of the soiled dollar bills she had found somewhere. 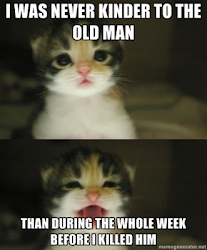 This continued, week after week. People tried craftily to trail Dumpy on her daily rambles and to find out whence she got the money. But always the wise dog gave them the slip; using the cunning of a wolf, to elude her followers. And every day she brought home a dollar bill. Never for a long while did she bring a bill of any other denomination, never more than a single bill. Mrs. Stiles took a handful of this cash to the nearest bank to have experts decide whether or not it was counterfeit currency, and to tell her if it was marked or "wanted" or if it were "hot money." The bills were proven genuine. Nor were they marked, nor on any list of "wanted" money. And the mystery deepened. The story reached the newspapers. Reporters tried to shadow the dog, on her walks. But she dodged them as easily as she had eluded the neighbors. And still the money came in, always a dollar a day. The press notoriety was quite enough to have warned anyone who might have hidden the cash in a supposedly safe place where the dog had happened to find it, and to have given him full opportunity to remove what was left of the hoard. But it was not removed. No neighborhood miser-stories were revived which might have given a clue. No, the money came daily from the earth--as was attested by the crumbs of fresh dirt sticking to it--and only Dumpy knew where in the earth it came from. Within a few months, $166 had been amassed. And the regular flow of dollars did not cease nor slacken. How large the treasure may be by the time you read this if Dumpy is still living and if the hoard has not been exhausted I don't know. Nor if, by that time, the mystery may have been solved. "I will gladly tell you in detail about Dumpy. So far, everything printed about her finding money is absolutely true; not even exaggerated. Since July 9, she has been bringing me one dollar a day, except once when she was poisoned and again when she had seven puppies. "The money brought home to me by Dumpy was all in singles; except, for several days, later on, five $5 bills; one of them a day. We have followed her, again and again. Always she goes toward an old gravel pit. But always she manages to give us the slip. "I keep on feeling sure each day's dollar will be the last. But it never is. When she began bringing money home to us we thought some one was giving it to her, though we couldn't guess why anybody would do such a thing. "So we notified the authorities. It was verified. That is how it got into the newspapers. And since then we have about as much privacy as Cobb's goldfish. But Dumpy's daily deed is doing much good, as I'll explain. "I decided that the money brought home by her was a Godsend and thus must be used for charity. I spent part of it for a Jersey cow, whose 12 quarts of milk a day I give to the Bexar County Tuberculosis association to be distributed among TB children. "In Dumpy's name also, I gave out many baskets of food for Christmas. And the money paid me for her pups (one of them, 'Two Bits,' sold for $25) goes to the Dumpy fund, to help the unfortunate. "This Dumpy fund is really worthwhile. For there are many who need help, in this region. Other contributions have been added to it by generous people." So, Dumpy s treasure trove consists not only of a dollar a day, but also of a good deed a day which is worthy of the best Scout traditions. When the first details of the mystery were printed, a year or more ago. I wondered what was going to be done with the money. It adds to one's faith in human nature to hear that it is put to such splendid use. Mrs. Stiles writes me that not one penny of the treasure is used otherwise than for charity. If ever the secret of the hidden fortune is made known to me, I'll tell you about it. Until then, as far as I can learn, there is no hunt as to the source of the money. As to Dumpy's continuing to bring it home, day after day, for such a long time well, to me, there is no mystery at all about that part of the story. 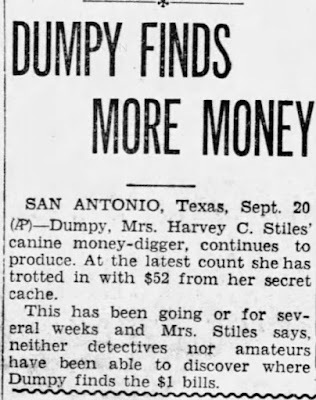 The last news item I've been able to find about Dumpy was in September 1939, where they indicated that the dog was still bringing home the dough. I cannot find when--or if!--the parade of bills ceased, or if they ever found Dumpy's hidden store of loot. In any case, I'm showing these articles to my cats. It's about time they started earning their keep.